Starting to build your church website on www.wordpress.org Hosted site,is a great way to get started. However what do you do when your ready to move to a Self Hosted? Let's discuss this, it pretty simple for the most part. 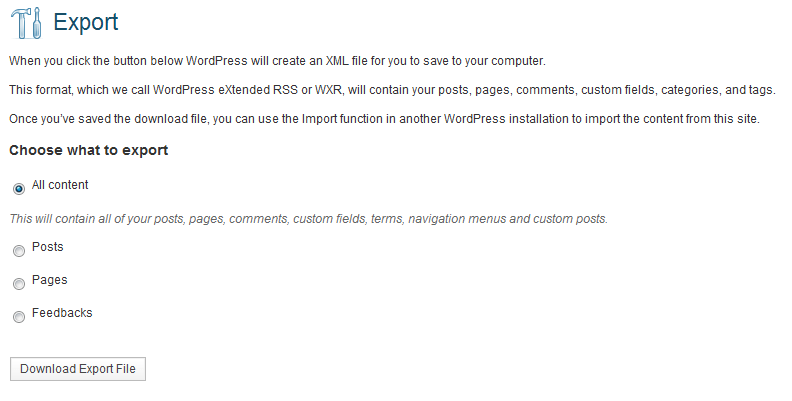 Then Click "Download Export File" save this XML file to you local file system. Now access Tools->Import from the Dashboard of your Self Hosted site. This will prompt you for the filename you to upload, select the file you saved in Step 4. Once complete all your pages, comments, and posts will now be on your new website. This is a very simple process to make this transition, but remember it also marks a transition in the responsibility.